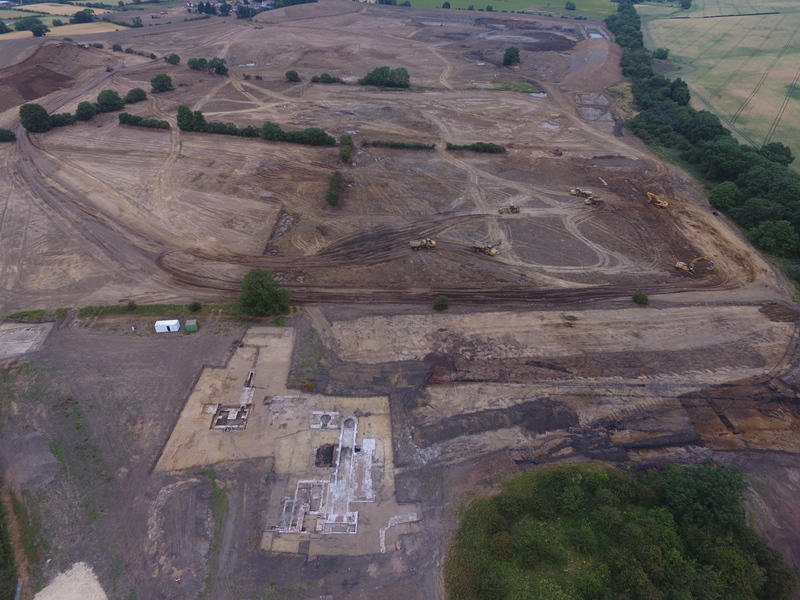 PCA Durham evaluated a 52-hectare site at West Rainton which had planning permission for an open cast coal mine. One hundred trenches were excavated, the majority of which only contained remains of medieval ridge and furrow agriculture. Trenches in the southern part of the site however revealed the very well preserved structural remains of a 19th- century colliery pit head. Coal mining in the Rainton area is recorded in documentary records from the 15th and 16th centuries onwards, and important archaeological evidence for early mining survives in the nearby area with extensive remains of drift, small scale opencast and simple shaft mines. The Lady Seaham Pit was sunk in 1836 as part of the Pittington Colliery and is recorded as an active pit on Ordnance Survey maps of 1861 and 1898. By the time of the 1923 map the pit buildings are shown as ‘disused’ and the railway branch line which led to the pithead without track. The mapping evidence shows that extensive rebuilding of the pithead structures occurred between the 1861 and 1898 Ordnance Survey maps and structural remains from both phases were encountered in the evaluation trenches. A backfilled circular stone-lined mineshaft and part of another shaft were revealed along with the corner of a sandstone building which formed part of the earliest phase of colliery. Part of a large square pit with a stone culvert at the base was also investigated and this may have been a large tank to contain water pumped from the pit; the 1861 map shows a narrow linear feature leading from the pithead to this tank which may have channelled water. To the south of the shafts was a complex of structures, walls and floor surfaces which formed part of the southern end of a large irregular-shaped building shown on the 1898 map. Individual rooms could be identified along with features such as machine bases. Sample excavation of overlying demolition deposits revealed well-preserved brick floor surfaces. Features and deposits associated with the branch railway line leading to Lady Seaham Pit, as shown on the 1861 and 1898 Ordnance Survey maps, were also recorded.